The Hilo branch. Monty Python fans will get it. (Picture credit: Joint Astronomy Centre). Little Eddie has a look that reflects my mood right now. The ground she's sitting on was a grass lawn last year and now it's dirt and roots. The tropical sun often kills off the grass in the summer months but not the roots, and the grass has always recovered by this time of year but not now; my garden has hardly any soil left at all, let alone grass. Local climate change is to blame I think. This winter we had tremendous rainfall that broke several records. My area received something like 50-inches of rain in a wild four days last February. I can't tell for sure because my rain gauge was underwater and then fried by a lightning strike (yes, it was an electronic gauge, I won't make that mistake again). For the first time since I bought my house, the garden flooded. Even the great storm of 2000 didn't flood it (25-inches of rain in 24-hours here on that unforgettable day, one place got 37-inches which is really hard to imagine). This year's flooding was followed by an extreme drought which is continuing as I write this. Several people I talk to that have lived in the islands all their lives say that they have not seen weather like this before. Droughts have happened before and I live a few miles from the wettest city in the USA, so meteorological extremes are not uncommon, but the one thing they all seem to agree on is that the Big Island rarely experienced thunderstorms yet now gets them all the time during the winter - and some of then are quite intense, just ask one or two of my unlucky house guests. I can attest (somewhat) to the thunderstorm experience - they didn't happen until a few years ago and since then my house has been struck by lightning several times. I've even see a tree in my yard explode. What a sight that was! The winter floods washed my soil away and replaced it with moss. The summer drought has killed the moss and everything else with it and left my yard with little soil and lots of exposed lava rock. I think I'll be busy next spring trying to fix this but at least will have a few months to read the odd gardening book before then. Then again, why am I whining? The sunset was wonderful this evening and the sunrise will be even better, and whenever I get fed up with the garden all I have to do is look around and take in all the beautiful sights of the island. A rare comment about politics from me: what a funny system the US has to let the public watch and hear the candidates for president of the USA. A debate that doesn't allow feedback from the audience - aren't they the voters and shouldn't they be allowed to ask questions? Personally, I felt the debate was a tie, but I would have preferred to hear the audience otherwise why were they there in the first place? Just to applaud when the candidates appeared and when they left? That's all they did and all they were allowed to do. Nothing compares to the old country's way of doing it; a sweat-inducing interview with Jeremy Paxman on Newsnight, and in real time and subject to audience feedback on Question Time. Not that this will guarantee the right person wins the vote, but it's fun to watch. I would pay a lot of money to watch Paxman interview Palin, but enough of that. I have the universe to explore and you never know, perhaps it really was created 10,000 years ago and we're all offspring of a tainted apple. I'm here because of my job, but I don't want to leave because of the beautiful sights I'm fortunate to see every day. The photo above simply can't do justice to the most amazing sunset I saw yesterday evening - it's from home aimed in the general direction of Mauna Kea (which you can't see due to the clouds). I wish I was a skilled photographer and also wish I had a better camera, this one's several years old. I've got my eye on a new one though. Sunsets like this usually mean a bad night for observers at the summit, and this was no exception. I wanted to title this Dark sky and no water but that would be confusing as this is a follow-up to my earlier post. A dark sky: There are no large cities on the Island of Hawai`i (no, Honolulu is on another island), in fact most of the island is unpopulated and therefore is lucky enough not to suffer too greatly from a common problem around the world - light pollution. Those of you that live in large cities and don't take the opportunity to travel to remote places will likely have never experienced the wonder of a dark sky; seeing more stars than you could ever imagine, the dark lanes in the Milky Way and perhaps even the Andromeda Galaxy with your own naked eye. In order to observe the faintest astronomical objects you need to have a very dark background, and that background generally comes from two sources: electronic noise in the instrument detectors, which we can take care of most of the time, or the sky itself. There are other sources and those can depend on what type of observatory you're using - more of that in a later post perhaps. The Mauna Kea sky is dark, very dark, except when the moon's up of course. We can schedule observations around those occasions though. Water: Actually, it's the lack of water in the atmosphere which makes Mauna Kea a superb observing site for infrared (IR) and submillimetre telescopes. It's probably second only to the South Pole (Antarctica) as an IR observing site and that's not the most inviting place in the world, so Mauna Kea is probably the premier site on this planet. 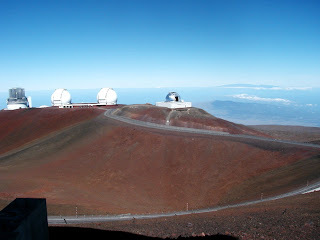 Although about 40% of the atmosphere is below Mauna Kea's summit, that includes about 90% of the atmospheric water. Water molecules are very good at absorbing IR radiation which means that if you have a lot of water in the atmosphere above you, the IR light from space gets blocked long before you can see it. This is an even greater problem for submillimetre telescopes (such as the CSO, JCMT and SMA) because water really loves light with a wavelength of a few hundred microns which is the "submillimetre regime". There are other molecules which are a complete pain: carbon dioxide is such a strong absorber of IR radiation that we have to go into space to avoid that one, but it only absorbs at very specific wavelengths so generally it doesn't have too much of an impact on observations - unless you want to observe carbon dioxide in space which is something I'd actually like to be able to do. The other stuff: I think I covered the important scientific reason to observe on Mauna Kea albeit extremely briefly and in a fairly unscientific way. There are a whole bunch of other reasons the mountain is such an excellent site including access (there's a road to the summit), vicinity to small but important population centres and their airports and sea ports, an energy infrastructure (i.e., there's electricity here) and a drinking water supply although it has to get trucked to the summit. This is all such a big change from the days I spent observing in a muddy cow pasture in the UK. When I first moved here years ago I couldn't believe the climate at sea level. The joke was that during winter a window in the house might be closed and no one would be found in the local swimming pool - I fought this concept hard because I still found winter time conditions too hot. Well, either I'm fully acclimatised now or I've turned into a local. It's hard to imagine the old days. It's 68 degrees on the Fahrenheit scale here (about 20 degrees Celsius) and if I were back in the UK this would be a balmy night with everyone out in the pubs' beer gardens and the weather forecasters warning everyone it might be difficult to sleep due to the warm and humid conditions. No way - I'm bloody freezing! Then again, I think I'll only really be considered a local if I start writing da kine in Pidgen, kay den, brah? Sorry, I'm not going to answer the Ultimate Question nor could I, so if you were expecting an answer, stop reading now. 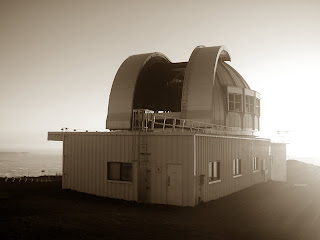 I would, however, like to attempt a lay person's explanation of why the summit of Mauna Kea looks so "unworldly" (first-time visitors often say they feel they're on another planet up there) and why there are about a dozen world-class astronomical observatories at the summit. Clouds: One of the banes of your common-or-garden amateur astronomer is the significant amount of time they sit around, freezing to death, waiting for the clouds to clear. No matter where you live, most days you look into the sky you'll see clouds of some sort. Professional observatories suffer in the same way (unless you work at a radio telescope or for Hubble) so why not build them above the clouds? 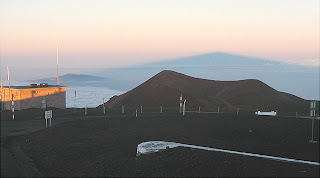 The inversion layer at Mauna Kea is typically around 6,000-8,000 feet so most of the time clouds form below the summit allowing us access to a clear sky. This doesn't happen all the time, obviously, and you get the most stunning sunsets when we suffer high-level clouds, but apparently there are 300 nights per year when the sky is clear at the summit - I suppose it depends on your definition of clear though. Seeing: Those of you who are lucky or unlucky enough to know an astronomer, amateur or professional, will no doubt have heard the word "seeing" on many occasions. I know most people don't know what it means and assume, incorrectly, that it refers to how many things you can see in the sky. It's actually a measure of how small a star appears in the sky. The smaller the number, the better the seeing (it's normally measured in arcseconds, or 1/3600 of a degree, i.e., it's an angular measurement). As a young lad (sigh), I spent many awful hours in the middle of a cow pat infested field training to be an astronomer. Why didn't I just become a banker? (Oh, I remember now.) Our typical seeing was 5 arcseconds on the three nights a year it was clear. If you are lucky enough to see a star from a city, the seeing is probably much worse than that. The average seeing on the summit, however, is 0.5 arcseconds (and clever optics means you can get much better than this). This has two great advantages: 1) you can see much more detail in an astronomical object and 2) the light from a star is concentrated into a much smaller area which means your telescope and instrument become much more sensitive and so you can detect fainter objects. Why is the seeing so good? There are several reasons, but mainly it's because the observatories are above much of the atmosphere - about 40% of it is below the summit. Turbulence in the atmosphere causes bad seeing, so if you're above much of it you'll benefit. Secondly, Hawai`i is an island in the middle of an ocean rather than a large land mass like North America or Europe. You could build an observatory in the Rockies or Alps, but imagine where the low-level winds blow. A large mountain range forces the winds up and over the summits causing turbulence and therefore bad seeing. On the other hand, the low-level winds just pass around the flanks of Mauna Kea leaving the summit alone. So why was it so windy last night? Part II later this week which will hopefully include a bit about water, as the lack of it is crucial to most telescopes at the summit. My career as a golf analyst was short and not very sweet. The USA thrashed Europe today in the Ryder Cup, a most emphatic victory. Congratulations, USA! As a teenager I played all sorts of sports. Cricket was my main love and I even managed to attain quite a high level despite some handicaps (not being a posh person with lots of money being the biggest one). I represented my county on a few occasions and was lucky enough to play with and against some athletes that went on to represent their country at the highest level, even captaining it. I was pretty good at football as well (soccer for my American friends), goalkeeping was my speciality. Football was cheap, we only needed a makeshift ball and our coats to mark the goalposts. Golf was a very strange compromise; you needed some money to play, especially upfront to buy golf clubs, but you didn't need fantastically rich parents to do well (unlike cricket in those days). My best friend and I played at our local course every spare minute we could find. It cost us 2-pounds ($4 these days) for a round as long as we started 2-hours or less before sunset. Racing around the course kept us fit, and caddying at Sunningdale raised the money (and also kept us fit). A couple of injuries stopped me playing golf a while ago, but I still follow the sport and hope to play again soon, and the Ryder Cup is the pinnacle of that sport - it's competition at its finest and fairest, even if commercial interests have taken over somewhat. I caught the end of today's play on TV after coming down from the summit and was disappointed. I heard the crowd chanting "USA, USA...". Disgraceful behaviour. I also heard, from time-to-time, "Olé, Olé" from the European supporters. In either case, that's just not cricket, er, golf. Then I remembered where I live and make a living - the USA of course, but I grew up in Europe and make my living here due to the education I received there. So who should I support? The 2009 Ryder Cup will be tied. That's i) my prediction and ii) my hope so I don't have to worry about my conflict of interest. To my family in Austria: the families of Elfie & Heinz and Erich: Barbara, Gerhard, Suzie and your families as well, and more than anyone, my Mum, Kathrin, who has lost her closest sister. I wish I could be with you during this sad time. Therese was my second mother and my memories of her will never fade. I am blessed to have known her and all of you. 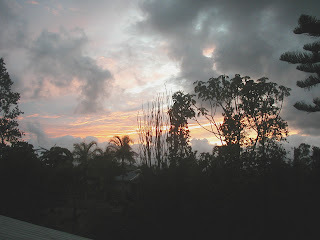 The sun has just risen above the clouds over Hilo Town to the east and the early-morning commute for many is just beginning, while for some of us the work day is coming to an end. 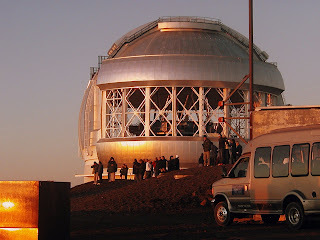 The observatory is being shut down and secured for the daylight hours after performing flawlessly overnight and I take a last opportunity, at least for a few hours, to take in the sights of a Mauna Kea sunrise. Only a handful of tourists are here this morning, they would have had to have left a couple of hours ago to ensure making it to the summit in time for sunrise, and this time they are all on the eastern side of the summit ridge watching a new day begin in the middle of the Pacific Ocean. I've seen a few sunrises over the years and can't help being intrigued more by the sight in the west - the shadow of Mauna Kea again, this time much sharper than its evening cousin and dwarfing Hualalai volcano to the left. Hualalai is potentially one of the most dangerous volcanoes in the U.S. and threatens Kailua Town on the west coast of Hawai`i, but it looks so insignificant this morning. I wonder, if I look hard enough, could I see my own shadow in the distance? 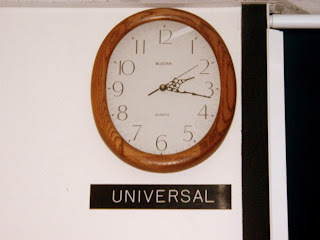 It's just gone 02:15 universal time; that's 4:15am Hawaiian standard time, or way past bedtime. The constellation Orion is almost overhead, a sure sign winter is approaching. The sun rises in another 105 minutes when we'll leave and brave the treacherous summit road to HP and breakfast! This is a difficult time of the night, concentration is difficult and it's easy to close one's eyes and drift off, but there's still work to do. Fortunately it's still summer so the nights aren't as long as they could be, it's a mere 13-hour shift tonight. Come the winter, they'll be 14-hours long and would be longer were it not for our safety rules limiting staff and visitors to a maximum of 14-hours at the summit in any 24-hour period. Thanks for small wonders! It's been a beautiful night and a very productive one. We'll drive down feeling very satisfied. The sun has almost set and it's nearly time to start working, but I rarely pass an opportunity to take a quick stroll outside while there's still enough light. Today I glance around and nearly every one of the hundreds of tourists up here this evening are looking to the west, out over the Pacific Ocean. They're watching the sun sink below the clouds thousands of feet below us. Perhaps they'll be fortunate enough to witness a green flash - they'll be luckier than I if they do. Only a few of tonight's visitors realise that if they look to the east they will see a phenomenon they've probably never witnessed before, the shadow of a mountain in the sky. 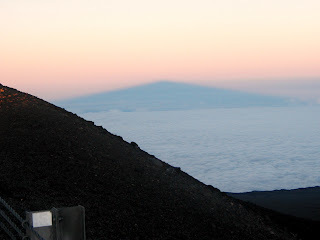 The dark triangle in the picture below is Mauna Kea's shadow. Beyond that a band can be seen in the darkening sky, the shadow of the Earth itself. What an extraordinary place this is. It's time for another observing run at the summit of Mauna Kea so off to the mountain I go - for a night to acclimatise at around the 9,000 foot level. The astronomers that visit the summit stay at a place called Hale Pohaku (HP, or, a little more sarcastically, "Vacation Resort Hale Pohaku") which translates to "House of Stone", although it's mostly made of wood. Actually, I think the official name is now "The Onizuka Center for International Astronomy" but it's easier to say "HP" with an oxygen-deprived and befuddled brain. Incidentally, Ellison Onizuka was an Hawaiian astronaut that was killed in the 1986 Space Shuttle Challenger tragedy. Most, if not all the observatories, have strict rules about visiting and working at the summit. With us, if you are going to spend more than eight hours at the summit then you must stay at HP for at least eight hours in order to let the body learn to cope with the reduced oxygen levels. Visiting astronomers tend to go up at least 24-hours before a run as they are less used to the altitude while the local workforce go up a little later. 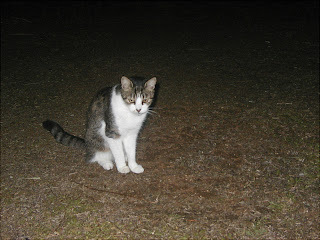 My own schedule varies: sometimes I go up 24-hours beforehand, sometimes it's just before dawn on the day I'm observing. It depends how I'm feeling and often on how recently I last spent significant time at the summit. The first night at HP is never very pleasant. You find your heart pounding as it adjusts to less oxygen and sleep is difficult. Well, that's OK you think because you can stay awake and adjust to working at night, but get so tired by 2-am that you have to go to bed - and wake up half an hour later because your body just can't relax. I've yet to find the right solution to this although I can tell you that I get through an awful lot of books while on the mountain. The views at sunset and sunrise will make up for it all though. This latest discovery from a team using the Gemini North telescope on Mauna Kea is cool, literally. Cool as in 1) the object they've discovered is too cool to be a star or even a brown dwarf, and 2) this may well be the first planet orbiting another star that's been imaged from Earth - and at 500 light years away it's quite a distance from us! It's going to take a little while to confirm that the planet, which is about eight times more massive than Jupiter, is actually part of this star's solar system and that the team haven't been horribly unlucky with a line-of-sight effect (it's happened before though); I assume they'll be measuring the star and planet's proper motion to confirm they are gravitationally bound. (Proper motion is just a clever name for an object's angular movement in the sky). What's strange, if indeed it is confirmed that the planet is orbiting the star, is how large an orbit the planet has as it's much further away from its parent star than one would expect using our own solar system as a model, yet the star is not dissimilar from our own. I guess it could be a captured object but that would be very unlikely, although we do know there are free-floating brown dwarfs out there. Just as the recently newsworthy LHC is probably going to lead to some new physics, so are the stunning observations that modern telescopes are making all of the time now. 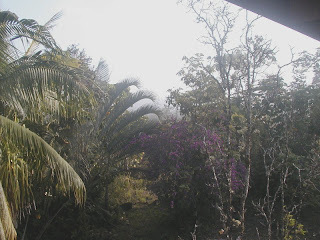 I grew up in England and am used to waking up to foggy mornings, especially around this time of year, but in Hawai`i? And what's with the strong smell of sulphur? Well, the Big Island is one of the most beautiful places in the world, but nature likes to balance things out and this place is subject to almost all the natural disasters one can think of, including tsunamis, hurricanes, floods, earthquakes and volcanic activity. It's the last of these that causes what's known as VOG, or volcanic fog. 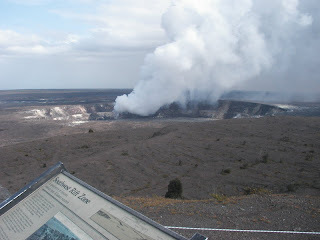 The island is made up of five volcanoes, Kohala, Hualalai, Mauna Kea, Mauna Loa and Kilauea. Mauna Loa and Kilauea are the most active and Kilauea has been erupting continuously for around the last 25 years, but not at the summit. This changed a few months ago when a new vent appeared at the summit (Halema`uma`u) along with a few small explosive eruptions (the first since 1924 apparently). Just recently the researchers at the Hawaiian Volcano Observatory (HVO) managed to get a glimpse down the vent and found that there is a large molten lava lake just underneath the crater's surface. Oh great - I live about 20 miles from the summit! Normally the trade winds blow from the east and the volcanic plume is blown over towards the west side of the island, but on days like today when the trades have stopped, the plume just lingers around the summit and slowly spreads throughout the local area. This stuff is nasty, it's mainly sulphur dioxide which can cause people severe breathing problems. There have been some evacuations recently due to this. Hopefully the trades will return soon and blow this stuff away. I thought it might be appropriate for my very first blog entry to be about the unique, beautiful and yet often thoroughly unpleasant place I find myself on more than the odd occasion. Unique in that there are few 14,000 ft volcanoes in the middle of oceans that actually have a thriving industry on top of them, beautiful in that the views are indescribably wonderful and thoroughly unpleasant due to the cold, high winds and more than anything else, the lack of oxygen that would have anyone experiencing the same oxygen blood levels at sea level on medication and a medically prescribed oxygen supply. 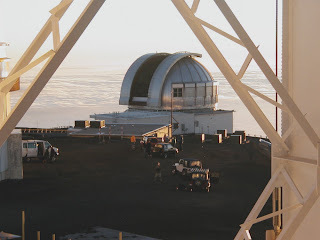 The summit area hosts twelve astronomical observatories, more on those in another post and the reasons they are there in the first place. 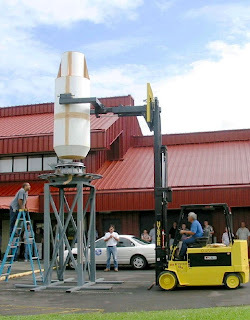 The list includes the giant Kecks, Subaru, CFHT, Gemini, UKIRT, JCMT, the NASA IRTF, CSO and the SMA. Mauna Kea itself is a dormant volcano which last erupted something like 4,500 years ago. It's likely to erupt again in the future although the people who work there and those that take a break from the beaches and visit the summit are likely to get some advance warning of another eruption. That's what we've been told, anyway. The summit is an oxygen-deprived 13,796-feet above sea level (4,205 metres) which ought to give you a great view of all that surrounds the mountain, but usually clouds prevent the rest of the island being seen although often around dawn the low-level clouds have dissapated enough for those at the summit to get a glimpse of the coastline - it's only then you realise how high you are! I thought I'd at least try and learn how to post pictures here, so put in a couple of examples of my very poor photography. I hope to improve. The picture at the top was taken from the so-called summit ridge, the highest point on the mountain with observatories. From left to right you can see Subaru, the twin Kecks and the NASA IRTF. It was a rare day when I took the photo (many years ago!) as you can see the north coast of the Big Island (Kohala) and beyond that in the distance the summit of Haleakala on Maui. I've never seen any of the other islands from the summit and am not even sure it's possible. I keep looking though. 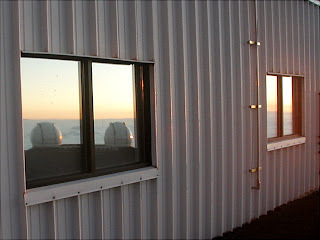 The picture below was taken from the Gemini observatory close to sunset looking roughly south-west. The telescope you can see is the UKIRT opening up before sunset in order to cool the dome by allowing warm air to escape before observing starts. Those people hanging around outside are a small subset of the hundreds of tourists that visit the summit every day eager to see one of the most amazing sights in the world, a sunset from Mauna Kea.